A collection of maps that have been put together and released in one pack. Fight your way through some industrial, Ravenholm, and prison areas until you reach the “END”. 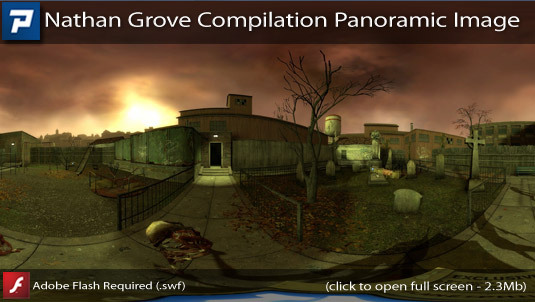 Copy all the .bsp files into your Half-Life 2: Episode Two Maps folder. Copy all the .ain files into your Half-Life 2: Episode Two Maps/Graphs folder. Open the console and type map of_sewers_01. This is an interesting collection of maps. Some I have seen before, others are new. Even though they weren’t supposed to be joined the author has done a good job of making them all feel pretty natural. There was too much vent crawling for my liking and the lighting was a little strange in some places but you should enjoy yourself for about 40 minutes. – the map “of_town_06” has a leak. I noticed the weird lighting (screenshot 33) and I decided to check with mat_wireframe. The entire map is being rendered. There is a leak. – There is a part where you must pull a lever to open a gate. (screenshot 20) but at first I did not notice the lever. I climbed on top of the gate and from there I could go to places that were clearly not intended to be accessible. Also, what was up with the spinning blade in the vents? I destroyed the crate before I could notice that blade and then I saw a sign that says that the equipment starts and stops automatically. I waited for it to stop automatically but it didn’t. I crawled through it while it was spinning and I took no damage from it. If I was registered here, I would probably give this a Play it now rating. How could he release a map with a leakkk in it?! I’ll give it a play later tonight, but leaked maps are sooo ghetttooooo. Single maps cleverly joined together and pretty much merging well. Combat: The first few maps are not a stern examination of your skills. Indeed, the enemy are a bit sparse but there’s always one or two to keep you engaged quite frequently. Things warm up a bit in the later maps especially the last map against the Combine. I enjoyed it and recommend a play. i agree with what has been said about the maps smoothly fitting together. though the gametime was very short. it was entertaining. It was fun, not very challenging for the most part, but a nice collection of maps. There were indeed some parts where the lighting was odd, or you could see behind things where you shouldn’t. But still, very nicely done and while the maps themselves didn’t seem to have anything putting them together, they did fit pretty well into a mood. I’m glad my first instinct whenever something surprises the crap out of me in a mod/game, is to hit my mouse. SURPRISE!WALL!B’BLAM! More maps to put in the map folder.Aaargh I hate that.Will make it a folder for source mods tonight. Simple experience. I almost considered giving it a maybe, but there were actually a number of puzzles that were well implemented. Ammo could have been drastically reduced, and a zombine or two would have helped shake things up. As it stands, don’t drop what you’re doing, but it’s worth playing when you have some time. I’ll start on the bad points. Lighting, where was it coming from? More work on that would have made the maps ALOT better. There were lots of leaks. More optimization would have made it run like a dream on my system. I’m sure there were other bugs, but one that I noticed a lot, was some wired doors, but clipped into other doors, and I had the HEV suit appear behind me on a map change. Now for some good points. Despite the bugs, it was playable and fun. I loved the fact that we are playing as good old Adrian Shephard, but not much back story. G-Man sighting, loved them, it brought back the feeling that I was playing a Half-Life map pack. The first half of the map pack, is all zombies, and actually made me jump once or twice (or maybe it’s because its 2 AM here). This was a fun 30 minute map pack with bugs which is the only thing that let it down, the ” END” was kind of disappointing, kind of wanted a battle but can’t have everything. I’m going to give this a “Play it Now”. A fairly easy paced adventure that never gets too challenging, but well worth the play through when you have time. The maps merge together reasonable well without being too disjointed from a playing perspective although the technical merit between maps is varied, however, I will leave that aspect to others to comment on in more detail. Overall I enjoyed the play through which was interesting and short enough to finish in one sessions, and although it’s obviously been thrown together to create a playable game with a few rough edges, it’s still better then a load of recent releases that were immediately forgettable. Its worth playing and a bit of fun.I was confused at times as I know I played some of these maps and was waiting for the next part but it went elsewhere. A very entertaining set of maps. Nice straight forward, and mostly business like map-pack. Maybe not the best, but far better than a casual reader might think reading some of the comments. Some “oooh, didn’t expect that” moments, though obviously not with the clichd and more or less obligatory “head-crabs in the ventilation” thing….and some “No way am I going to get out of this” ones, until you suddenly do, and have hardly lost any health in the process. I wonder if the author got as far as he could be bothered and then just let it go, as clearly a lot of work has gone into it, but what the heck, it’s a pretty good piece of work, warts and all, in the middle of a pretty severe drought. PIN if you haven’t already. Thanks, and yeah, I did get pretty bored of making this map halfway through. Thank you everybody for the feedback and constructive criticism. I had no clue this site existed until today, so I had a lot of fun sitting down and reading everybody’s comments. I’m currently working on a new (more completed and professionally done) map that I think you guys will love. I’m taking everybody’s opinions into account with this one too, so I know what you guys are looking for. I know I play on Easy, but this was almost too easy? Maybe just too much ammo/health (even though I wasn’t ever sure there’d be more). Maybe not quite enough enemies. Maybe not quite enough of a mix of enemies at the same time. There were definitely some places where I expected the combat to be harder than it was (fast zombies, gunship). But the combat pacing was generally good and you included some puzzles (I only remember the electrified water right now). Even though they weren’t meant to go together, the maps fit pretty well. I have to agree with some of the criticisms above: I, too, missed the lever by the gate in the town, and so ended up stacking barrels and jumping out of the map. That very same map had a crease in one of the walls where you could see out into the skybox. There was a battle in the prison where a combine floodlight is casting the shadow of a set of stairs against the wall and ceiling. This area is what lightmap level 1 exists for! 😛 The shadow was a bit choppy and lumpy looking. There were a couple of gameplay choices that I disagreed with. For example, at the very beginning of the prison maps, you get caught between two gates, leaving you trapped like a fish in a barrel. The player needs some sort of cover to make that gameplay mechanic fun. The same is true of the gunship battle: there wasn’t enough space or cover, and the environment wasn’t interesting enough. All in all, it’s pretty okay. If it was originally a bunch of unlinked maps that have been cleaved together, then I sure didn’t notice (except for the abundance of load points; the maps felt a bit short and stunted at times). Lots of potential, though, and some really fun sequences. There was cover, the SMG1 ammo crate, crouch behind it & get a perfect bead on their heads! Of course, if you just stood there, well – tough lumps. You know, this is a PF for me. I enjoyed the simplicity and the fact that it was OTT with stupid puzzles or a design that frustrates. It was so enjoyable. Yep, enjoyable is the word. I’m keeping this “one” installed and will play again for sure. Loved it and I’m hoping more is to come from Nathan. I found this collection of maps really amateurish. The author copied all the cliche and ideas of the original game. Even the graphic was really similar to ravenholm and nova prospekt.